HubSpot was founded in 2006 by Brian Halligan and Dharmesh Shah, who met as graduate students at MIT. The platform was intended to address the shortcomings of traditional, interruptive marketing and sales tactics by promoting more personable and empathetic marketing engagement. The idea caught on; the company grew from $225,000 in revenue the first year to $15.6 million in 2010. HubSpot offers a sophisticated online ecosystem with an ‘all in one’ approach to marketing and sales, and is well-known for its inbound marketing tools. Yes – the CRM is free to use. Yes, HubSpot CRM allows unlimited users and comes with HubSpot Sales Free and HubSpot Marketing Free. 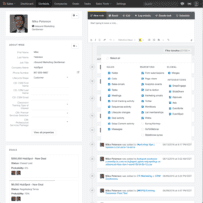 HubSpot CRM is free to use. There are some restrictions on features that which can be expanded by upgrading to HubSpot Sales Pro or by subscribing to a paid HubSpot Marketing plan. *Numbers of contacts are upgradeable for additional fees per month. See here for HubSpot Marketing plan details. 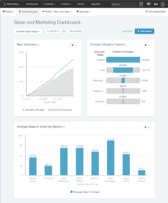 HubSpot provides a searchable knowledge base with documents and other learning resources. This and online helpdesk ticketing are available through their support website, available here. Free users can find further support from the HubSpot customer forum, staffed by other HubSpot users, partners, and employees. Answers to API questions can be found in the developer community forum, and design-related questions can be directed towards the designer community forum. HubSpot customer support can be contacted on Twitter at the handle @HubSpotSupport. Customers willing to pay extra for prioritized or personalized support have two options. Designated Support, $500 per month, Ongoing access to Designated Support Engineer via phone and email for technical questions, Note: DSEs are only available in English. HubSpot encourages users to form local HubSpot User Groups (HUGs) to meet and discuss strategies and use cases in their communities. There are over 15 HUGs worldwide in the US, UK, EU and South America. The full list can be seen here. HubSpot also makes available a marketing resources library with how-to guides ranging from general internet marketing, social media lead generation, ebook and budget templates and so on. The marketing resources library is searchable by topic and can be reached here. HubSpot provides online courses, accessible within the platform, for users to gain experience and certification optimizing HubSpot tools in certain disciplines, such as Inbound Sales, Growth-Driven Design, Email Marketing, HubSpot Sales Software and Content Marketing. It is difficult to evaluate the HubSpot CRM (which includes HubSpot Sales Free) separately from its Marketing software – the online ecosystem is clearly intended to be used with all three branches of the HubSpot platform – CRM, Sales and Marketing. However, there are use cases in which CRM is needed separately from marketing features, and though HubSpot offers considerable features for optimizing inbound marketing strategy with blog SEO, landing pages, email marketing, social media monitoring and analytics reports – if you’re interested specifically in a CRM, with or without sales tools, that extra functionality won’t appeal to you. The good news is you don’t have to pay for that. You’re free to use the HubSpot CRM for as long as you like with unlimited users for up to 1 million Contacts, companies, deals and tasks (that’s 1 million total, not of each category). Meanwhile, the Sales Free features include Gmail & Outlook integration, CRM integration, email scheduling, open notifications, limited tracking and templates functionality and limited calling. The bad news is, while using the free version, the UI clearly indicates which of the several features restricted to paid plans – a small nuisance, but if you’re content with a lightweight CRM with fewer features, these extra features that you don’t and can’t use will feel like useless clutter. But the UI itself is otherwise quite polished. The Deals pipeline has custom filters and switches between the drag-and-drop board view and a list or ‘table’ view very easily. Your contacts can be imported via CSV file – I found the experience a little less convenient than with other CRMs which can import contacts directly from popular email clients (Gmail, Outlook) as your CSV file may need adjustment before the contacts can be imported correctly. On the other hand, contacts are automatically de-duplicated upon importation, which is nice; if the same contact is imported on two separate CSV files, but has the same email address, HubSpot CRM will update the existing Contact without creating a new one. The profile view of a Contact or company is well-presented and comprehensive. It’ll show their professional and contact details, as well as the properties you associate with each contact (HubSpot allows custom properties), the update history of said properties, a timeline of tasks and events with the Contact and a prominent window for making internal notes, sending an email, making a call, logging activity, creating a task or scheduling a calendar event. It’s a very well-rounded range of features for a profile page and it’s easy on the eyes. 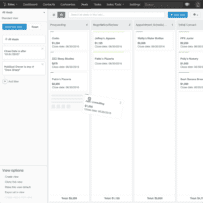 The Deal and Task management pages are similarly sleek and responsive. As mentioned, the CRM integrates with Gmail and Outlook which allows emails to be sent from within the CRM. This is a great timesaver; you can apply templates and see how the finished email looks before sending it. Of course, with Sales Free you only get 5 templates, and you can only send ten emails per Contact per month, but if your use case doesn’t require extensive emailing this may be sufficient for you. In the end, few things in life is free (and when they are, they’re sometimes CRMs). 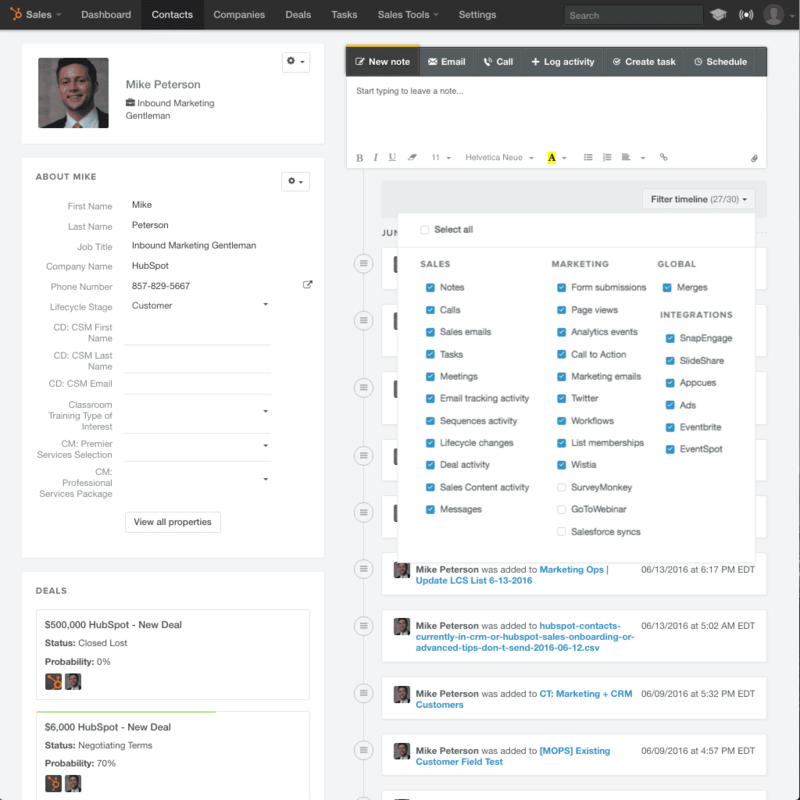 HubSpot gives you unlimited use of a CRM with an eye-friendly UI, useful but restricted features and a fairly narrow cap on records. If you happen to have need of their Sales Pro and Marketing plans, you’ll get a sophisticated online ecosystem to generate and qualify leads and align your sales and marketing teams. But if you only need a CRM, you’ll get a nice layout with a short list of decent features, with many tantalizing glimpses of its potential tucked away behind a paywall. What Do You Think of HubSpot?